The Royal Palace - A visit to the capital, Phnom Penh, is a must. This exciting city is a great place to start your Cambodia adventure, especially since it's here that you can find out a lot about its history. Of course, not all of it is particularly pleasant - in fact, a lot of its recent history is absolutely harrowing - and some good spots for a gentle introduction are the Royal Palace and Wat Phnom (which is the most important temple in the city). You'll find the Royal Palace in an amazing location near the river, tucked away behind high walls. Head inside and you can get a close-up look at the Khmer roofs the architecture here is famous for, and the individual buildings that are particularly iconic, like the Throne Room of Prasat Tevea Vinichhay. This is where kings are crowned, as well as being a venue for traditional ceremonies. Without doubt, one of the most impressive sights in the complex is the Silver Pagoda, which you'd have to be crazy to miss. Given its name, you've probably guessed there's a fairly hefty silver element and you won't be disappointed on that front: the floor is laid with 5,000 silver tiles. Toul Sleng Museum and The Killing Fields - Once you've got your bearings in Phnom Penh, it is well worth heading to some of its historical sites. 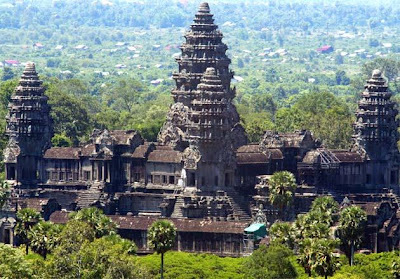 Cambodia has a bloody history, so you should be prepared for these to be fairly unpleasant excursions - but if you really want to learn about and understand the country, you can't really avoid it. In 1975, the Toul Sleng Museum was Security Prison 21 (S-21), filling what was once a school building. It became the largest detention and torture facility in Cambodia, and today it stands as a reminder of the horrors of the Khmer Rouge regime. All the prisoners were photographed and it is these pictures you can see by visiting today - so prepare yourself for an emotional experience. Just outside Phnom Penh are The Killing Fields, which is where prisoners from S-21 were executed - and is now home to mass graves. Another chilling experience, a trip here really brings home the atrocities of the regime. 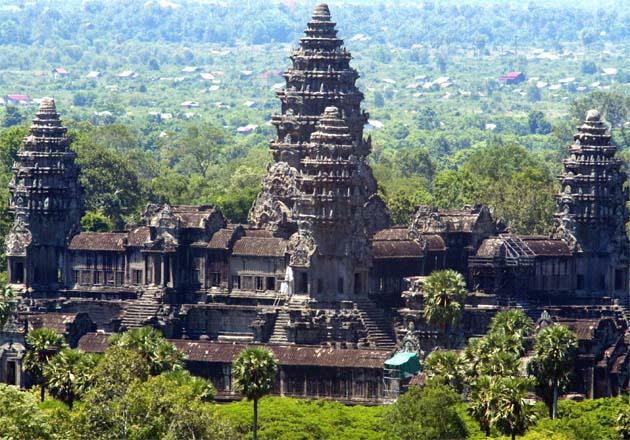 Temples - Move on to the city of Siem Reap and you can see Cambodia's next iconic sights - the splendid temples of Angkor. Since there are so many to see, it's easy to spend a few days here wandering around each in turn, such as The Elephant Terrace and Angkor Thom. But if you're short on time, there's one in particular that you really can't miss, and that's Angkor Wat. This is undoubtedly the nation's most famous temple - it's even on its flag - and with good reason. For a start, it's the largest religious building in the world; it is also among the most visually breathtaking structures you are ever likely to see. Famous for its symmetry, unique decorations and complexity, it dates back to the first half of the 12th century. When visiting, bear in mind you can only enter and leave through its west gate - and be prepared to be awestruck! If you're planning to head overseas for adventure travel for several weeks or months, it's also worth considering other kinds of activities to add into your itinerary. Volunteering, for example, is a really good way of getting to know any destination better, so it's something to think about.